References / Referencias, originally uploaded by victor_nuno. As each morning, when the sun comes out, sunflowers get ready to follow their light, their strength and their source of life, shining and following their reference. Which is yours? Which is the reference that you follow? Como cada mañana, cuando sale el sol, los girasoles se preparan para seguir su luz, su fuerza y la fuente de su vida, brillando y siguiendo su referencia. ¿Cuál es la tuya? ¿Cuál es la referencia que sigues? La que me dicta la vida y el corazón. Un placer volver a ver tus imágenes y leer tus palabras Víctor. Seguir adelante…sin perder el norte ni el alma!!! This is an Amazing Shot! Please consider adding your photograph to the group Amazing Shots!! Ciao, sono amministratore di un gruppo chiamato 100% relax :-). Ci farebbe piacere aggiungere l’elemento al gruppo. Beautiful in its entirety, Victor. 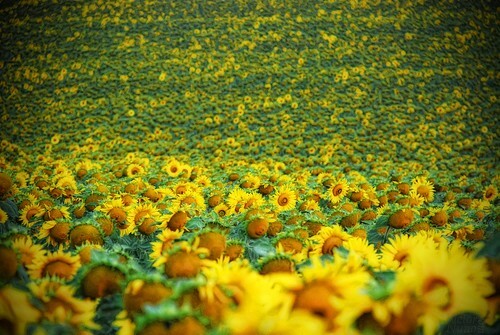 As you know, I really want to see a sunflower field. This is really a gift to the eyes. We all have references to follow,… I guess coffee would be my first morning reference, as to open my eyes to the day! ;) May you enjoy your coffee along your morning with a smile! wow, that is amazing! I haven’t flickred for a long time~ But,… your photos are still that amazingly beautiful and…. I don’t know what to say…. You are way better than some so-called professional photographer! Estoy con Lorena, parece una caricia, una suave cama…. what I see is a field full of beautiful fantasies ;) Love this image my dear friend. Hope all is well, and thank you for the kind wishes. Cheers! I love love love this one!!! !So unlike anything I have seen before! BTW, where was this shot? !